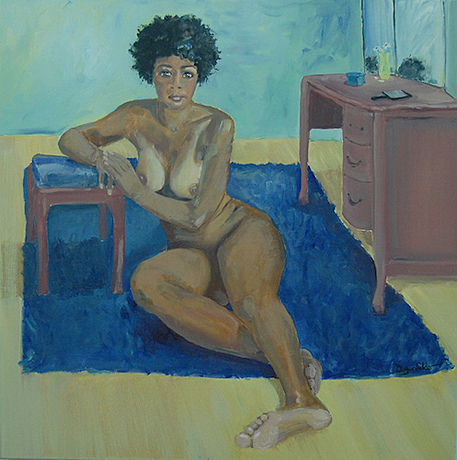 Her Vanity, Oil on Linen, 30" x 30"
The human form has always been the primary focus of my work. I vividly recall the moment when I experienced my first live model in a Life Drawing class. I had never encountered anything like it. It seemed truly like an epiphany; because from that day I was irresistibly drawn to painting the figure. I knew, with such a deep, unquestioning certainty, that this was my path. What I enjoy most about figural work is the lyrical, expressive feeling of it, the line, the shapes created, the negative space. Somehow, it seems to have almost a musical quality that pleases my soul. It is a way of being in touch with that which is most human about us, the form we present to the world. I have been working more abstractly in recent years, in both nudes or other figural pieces. The spectrum of abstraction in art is a broad one, and I feel compelled to explore the figure within that spectrum. It is satisfying to me as an artist.